The best kitchen remodels speak to your personality. You want a kitchen that provides all of the resources and space you need for your everyday tasks, while also displaying a look that shows off your personal style. The secret to being happy with your kitchen remodel is to pick cabinets that not only resemble your favorite model homes, but also function well for your regular kitchen use. Remember, no two people are the same, and you want your end results to reflect who you are as a person. Looking at the kitchen remodel in totality can get overwhelming, start by solely focusing on the type of cabinets that you want in your kitchen. After all, your kitchen cabinets get a lot of attention; cabinets are used everyday and dominate the look of your kitchen, taking up the vast majority of wall space. Once you decide what type of cabinet is best for your life and personality, everything else will fall into place. 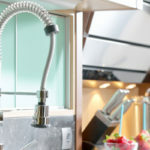 Here we help you uncover what type of kitchen cabinets are best for your personality—including questions you must ask in order to find the kitchen cabinets you are sure to love year after year. You have a personality and so does each member of your family. But did you ever stop to think what type of personality your kitchen cabinets have? Do you prefer a laid back look? Are you the type that prefers jeans to suits and a walk on the beach over a fancy art show? Then you are likely the casual type, but just because you are the casual type doesn’t mean your kitchen has to be boring whatsoever. A traditional kitchen might include wood cabinets and less extravagant detailing, but you can still add flavor to your kitchen by incorporating brightly colored accessories or painting your center island cabinets a unique splash of color. A brightly painted or tilled backsplash wall can also bring some jazz into an otherwise casual kitchen. Do you love wide-open spaces, big windows, and wearing all white? If so you might be interested in a contemporary kitchen remodel. Contemporary style is all about clean lines and limited distractions, contemporary cabinets are often installed flush with the box frame to reduce noise. Do you like the feel of an old kitchen farmhouse, like the kitchen you used to bake cakes with your grandmother in as a child? If so, a rustic kitchen design can provide the traditionally antique look you crave. Mix and match cabinet colors, opt for weathered looking appliances and make sure there is plenty of texture throughout your kitchen. Details are key. You want every piece to tell a unique store of its own, from the knobs on your kitchen cabinets to the knick-knacks hung from the wall. If gold and crystal accents make your heart flutter, a traditional style kitchen with all of the latest luxury upgrades might suit your fancy. Cabinets with unique detailing on the surface, hardware, and edges will add royal flare to your kitchen. You don’t have to keep everything the same, mix and match appropriate shades for a look that uniquely portrays the finer things in life. You have identified your style and which looks you like most for kitchen cabinets. Now comes the tricky part—uncovering the right type of cabinets for your lifestyle and personality, not just for looks but for functionality as well. With so many options the choices are nearly unlimited. Start by asking yourself some of the following questions to help answer what type of cabinets will work best for your kitchen. This is one of the first questions you should ask and answer, it’s no fun to find the kitchen cabinets of your dreams only to uncover that they don’t jive with your budget. Kitchen cabinets consume a good deal of any kitchen remodel cost, but you don’t have to break the bank to get great looking kitchen cabinets. There are 3 different types of cabinets available: stock, semi-custom and custom cabinets. The most affordable and popular option is stock cabinetry, making up 49% of cabinets in the US. Made to fit the standard size cabinet frame, stock cabinets don’t offer the same customization as semi-custom or custom cabinets. You will pay the most for custom kitchen cabinets—hence why only 18% of kitchen remodels include custom cabinetry. For a look that is easier on the budget but still made to order, semi-custom cabinets are a great option, used in nearly 33% of kitchen remodels (Learn More). 2. What Are Your Kitchen Remodeling Goals? 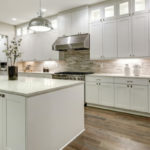 If you are remodeling your kitchen in hopes of upping your home value and soon making a sale, the priorities that you put into your kitchen should change. You will want to pick more standard features that will be appreciated by the majority instead of just you. 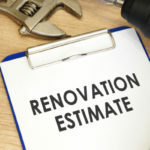 This will help make the sale of your house easier because potential buyers won’t be thinking about what they have to fix or change—which can really be a bummer when unwanted features appear new. There’s no need to waste your money on intricate detailing if you plan to sale your home, you won’t likely recoup your investment. If you don’t care so much about selling your home anytime soon, this opens up the floor for more creative details that represent your personal style. 3. Does Your Kitchen Remodel Match The Rest Of Your House? You want your kitchen to match with the rest of your home décor. You want to avoid people walking into your kitchen and feeling like they have entered a different house entirely. Creating flow throughout your house is important, if you install a very modern kitchen but have rustic country décor in your family room, this will stand out—and not necessarily in a good way. If you plan to upgrade one space at a time, this creates a different situation in which it’s okay for your kitchen to appear different, so long as the goal is to eventually match it to the whole house. 4. How Much Do You Plan To Use Your Cabinets? Are you the type who orders food out more than you cook? If so, the availability of cabinet space might not be as important to you. Some families need way more storage space than others; perhaps you can modify the number of cabinets you have installed in your kitchen to limit your overall cost. 5. How Organized Are You? This is a hard question to really ask, after all most of us try to be organized but finding the time and energy to do so can be a challenge. Go into your kitchen now and open a few random cabinets, what do you see? Are bags of food tossed atop one another, must you shuffle through a few random items to find the bagels buried underneath? There’s no need to be ashamed, the majority of kitchen cabinets across America are far from organized, life gets busy and with kids constantly rummaging your cabinets for snacks the mess can be impossible to keep up with. If this is the case you don’t want to invest in open-faced or glass panned cabinets—perhaps a few decorative show-off cabinets might be fine, but for the most part you don’t want the mess inside of your cabinets to show through and create a cluttered look. You can also opt for cabinets that offer organizational detailing to help make organizing easier. 6. Do You Like Bright Colors Or Classically Cool Hues? When it comes to picking the right colors for your kitchen cabinets your personality is very important. Are you more attracted to bright things, or do you prefer more subtle looks? 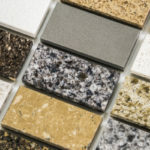 When remodeling your kitchen for you, ignore what others have to say about the ‘coolest new kitchen colors’ and dig deep to uncover what you like to look at most. Still struggling to decide? Try browsing through your closet—are most of your clothes black, white, and shades of light pink or beige? If so, a shocking kitchen cabinet color might prove too much for you to truly appreciate. If your closet is instead full of bright colors and unique patterns you might enjoy a fun splash of color across your cabinets. If you are looking for color but don’t want to go all out, you can stick with neutral wood, black or white cabinets and add decorative hardware knobs. Display colorful decorative pieces behind a select few glass cabinets to give a splash of color that doesn’t prove too much for your own tastes. Remember, no matter your personality, dark colors are going to make your space appear smaller and light colors are going to make your space appear larger. 7. What Cooking Utensils Do You Have the Most Of? Are you a baker with unlimited rows of cookie sheets and muffin pans? Or do you have a large family that requires numerous eating utensils? Uncovering the type of space you need most in your kitchen is key to getting cabinets installed that make your life easier. Are pull out drawers most important to you? Or do you need tall cabinets to accommodate large cereal boxes and other bulk food items? Installing cabinets that accommodate your regular purchases will prevent you from having to leave things out on the counters or above the fridge, where they only serve as an eyesore. Speak to one of our professional cabinet installers from Tops Kitchen Cabinets to decide which cabinets are best suited to your needs.